Previous links to posts and pages are being mapped across to the new domain but you may like to update Bookmarks and update links to the Home Page on websites and blogs. “There will be a live audio link to the two day meeting, which allows listeners to hear the entire meeting in real time. Due to budgetary considerations, we are unable to provide a live-video cast as previously arranged. We will provide a video recording of the meeting on the CFSAC webpage http://www.hhs.gov/advcomcfs . This recording will provide a higher quality video at substantially lower cost. The Spring meeting of the Chronic Fatigue Syndrome Advisory Committee (CFSAC) was held on May 10-11, 2011 in Room 800, Hubert H. Humphrey Building, 200 Independence Ave, S.W., Washington, D.C. The Fall meeting has been announced for Tuesday, November 8 and Wednesday, November 9 but will be located in a different venue. The November meeting will be hosted at the Holiday Inn Capitol, Columbia Room, 550 C Street, SW., Washington, D.C. See next post for Federal Notice. At the time of publication, no agenda for the Fall meeting has been issued. Of particular interest to the scope of this site was the Agenda item on Day One at 1:15 p.m.
Dr Wanda Jones, outgoing Designated Federal Officer for CFSAC, had invited a representative from the National Center for Health Statistics to attend the meeting, though no-one had been available for that date. Instead, Dr Jones presented Committee members with a four page document ICD-related questions from CFSAC for May 2011 meeting as background information. What are the key steps in development of the ICD-10-CM? 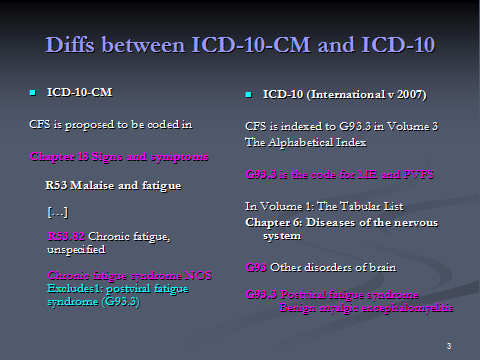 How does the ICD-CM (whatever version, -9, -10, etc.) align with past and current versions of the -CM and with the WHO’s current and past versions? How is the ICD-CM used in policy-related decision making? What difference does coding designation make? How do we get providers to use a particular code–is it an issue of education, of outreach, or what? If codes related to CFS are in several different places, doesn’t that affect the count? And finally, if the codes change, do we lose the numbers from the prior coding systems? How does ICD coding relate to DSM coding (or does it)? Following a 45 minute discussion of the forthcoming partial code freeze, the implications for CFS and ME patients of current proposals for ICD-10-CM and in the context of draft proposals by the DSM-5 Work Group for “Somatic Symptoms Disorders”, a new Recommendation was proposed by Dr Lenny Jason, seconded by Dr Nancy Klimas, and voted unanimously in favour of by the Committee. Information on the ICD-9-CM Coordination and Maintenance Committee September 2011 meeting referred to by Dr Jones, in the Minutes, can be found on this page. Information of the International Classification of Diseases, Tenth Revision, Clinical Modification (ICD-10-CM) draft due for implementation in October 2013 can be found on this page. Video of this section of the meeting can be viewed here at Videocast Day One at 4hrs 27 mins in from start of broadcast. I should like to thank Dr Lenny Jason, whose term as a CFSAC Committee member ends following the November meeting, for informing the Committee around current proposals for the forthcoming ICD-10-CM, on the classification of PVFS, ME and CFS in ICD-10 and on the development of ICD-11 and for also raising with the Committee concerns around DSM-5, an issue that had not previously been discussed in any depth at a CFSAC meeting. • Brought the meeting to order. Noted they would have a discussion of the ICD-related questions and the proposed reclassification of chronic fatigue syndrome. • Advised there was a page in the members’ notebooks tabbed after the State of the Knowledge summary which noted key steps in the development of the ICD 10 CM, so a clinical modification of the World Health Organization’s (WHO) ICD 10. It would replace ICD 9.
o Used by outside agencies to categorize the illness for purposes of inclusion or exclusion. Opened the floor for discussion. • Clarified that the committee requested that the National Center for Health Statistics have someone to talk to them about the international classification of diseases, about the process, about how the U.S. adapts the WHO index, ( the ICD) for use and about opportunities for dialogue. • Noted that a meeting was set a year ago for May 10 and 11 in Baltimore that engaged resources of CMS, parts of the federal government focused on health IT and the entire ICD team from the National Center for Health Statistics (NCHS). • Noted that as a result no one was available for the CFSAC meeting. • In lieu of their attendance, she developed some questions that the NCHS, ICD team responded to. • Tried to clarify the questions so they would have a good understanding of the key processes and the key inflection points differentiating the WHO process from the U.S. ICD-CM, the clinical modification process. • Raised additional questions regarding how alignment from prior versions is maintained and how ICD coding is used in decision-making. • Noted also the relationship between the coding and the diagnostic and statistical manual (DSM). Stated that the information was provided by the NCHS and is meant to generate discussion. • Stated that the ICD-CM process is a public process with regularly scheduled public meetings. Noted that there is an opportunity to comment as part of that process and to engage. • Confirmed that the NCHS stated that there has been no public presence from the CFS community at the meetings. • Noted that this was the process for people interested in CFS coding to become involved. Confirmed that there was a lock procedure that is soon to be executed for the ICD 10 CM. • Noted it had been in development for a decade and the United States’ move to electronic records means it has to temporarily lock the codes. The electronic health records software would not be ready if they keep changing them. • Noted that information about coding changes would continue to be collected, taken under advisement and the NCHS would continue the process of evaluating. • Stated that once it is in public use then that lock will release and there would be an opportunity on a periodic basis for updating. • Stated that the committees are developing ICD 10 CM and it intends to retain CFS in R codes (R53.82) and this means that the symptoms, signs, abnormal results of clinical or other investigative procedures are ill-defined conditions. • Stated that R-codes means it’s an ill-defined condition regarding which no diagnosis is classifiable elsewhere. Explained that if it cannot be diagnosed elsewhere in ICD 10 it goes into a R-code. 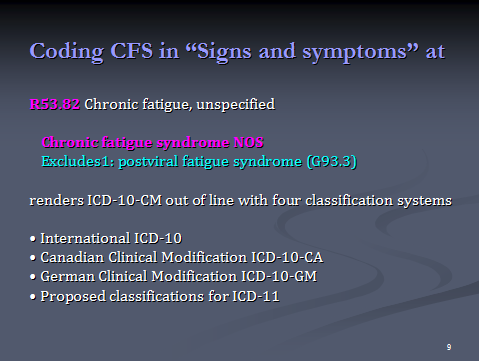 • The intention in ICD 11 is to put CFS with two other conditions (post viral fatigue syndrome and benign myalgic encephalomyalitus) under a G-code, being G93.3 or diseases of the nervous system. 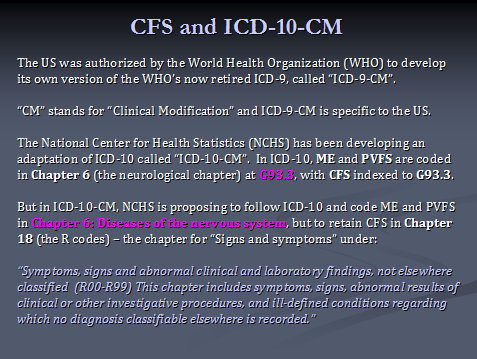 Noted that coding CFS under the R-code in the proposed ICD 10 CM would place it out of line with the International ICD 10 used in over 100 countries. • Discussed the problems and implications of the U.S. coding of CFS as compared with how other countries are coding it. It would exclude it from the R53 malaise and fatigue codes, which would imply that CFS does not have a viral etiology. • Noted that ME and CFS patients could be potentially vulnerable to the current DSM 5 proposals because those proposals are highly subjective and difficult to quantify. Dr. Klimas asked for clarification, and Dr. Jason said that in 2013 they would move from DSM 4 to DSM 5. As it stands they would be collapsing somatization disorder, undifferentiated somatoform disorder, hypochondriasis and some presentations of panic disorder [sic] [Ed: pain disorder] into complex somatic symptom disorder. Dr. Klimas clarified that his concern was that the CFS ICD 9 codes would put the non post viral patients into this somatoform cluster. Dr. Jason indicated that this was so. Dr. Klimas seconded the motion. Mr. Krafchick agreed and stated that the ramifications of the classification would be disastrous for patients, because it would limit disability payments to two years. Dr. Jones clarified that for now the clock was ticking, however once the codes were released, they could be revised, it’s just the implementation of the electronic system which is causing it to be locked at a particular point in time. While CFSAC has shared concerns with NCHS, there is an official process for engaging with them on their discussions regarding the codes. The US was interested in morbidity, in case claims. It is important that providers know how to best categorize things, and provide guidance on which codes to consider based on the science for the disease being evaluated. Dr. Jason said that his was dramatically different. Mr. Krafchick underscored how the insurance companies use these ICD codes. If it was classified in something that could be psychiatric it will be psychiatric, so they can deny coverage. Dr. Jones noted that the next ICD meeting is September 14 – 15, 2011 with public comments due July 15. Noted this will be put on the CFSAC website. She noted she would check the rules to see if a member of the CFSAC or the Chair would be able to give public testimony at another advisory committee meeting. Mr. Krafchick said that if it were possible to send someone as a member of the committee, it would make a great deal of sense and be very important. Dr. Jones said they would figure out how this could happen. Ms. Holderman asked whether this notice, and any future notices where they might want to intervene, could be placed on the CDC website. She stated this cross listing would be useful. Since I continue to be misrepresented on at least one platform I am reluctantly publishing a public position statement. ME agenda is the name of one of several WordPress sites that I own. The site name was registered with WordPress in 2007. ME agenda is also the username I use on Facebook, Twitter and on a number of other internet platforms. Within the last few days, ME agenda has several times been referred to as “a group” on Phoenix Rising forum and elsewhere. I have already clarified that ME agenda is not a “group” nor any kind of organisation. “Dx Revision Watch is not an organisation. “This site has no connection with and is not endorsed by the American Psychiatric Association (APA), American Psychiatric Publishing Inc., World Health Organisation (WHO) or any other organisation, institution, corporation or company. “This site has no affiliations with any commercial or not-for-profit organisation. The site operates independently of any patient or advocacy organisation or group. “ME agenda is not an organisation. “This site has no connection with and is not endorsed by any organisation, institution, corporation or company. The site has no affiliations with any commercial or not-for-profit organisation and operates independently of any patient or advocacy organisation or group. So ME agenda is not “a group”; does not function as “a group” nor as any form of organisation, and the name ME agenda and my websites are associated only with one individual – myself. The advocacy work that I do under my own name and in association with the name ME agenda is undertaken as an individual with an interest in a specific health area, as a primary carer of a young adult. I do not claim a mandate to represent others and the views and opinions I hold are the views and opinions of a single individual. I therefore request that neither I nor ME agenda nor my websites are referred to on any platform as “a group”, since this is erroneous and misrepresents me. that classifying Chronic fatigue syndrome under the Chapter 18 “R” codes, in ICD-10-CM, will render patients more vulnerable to the proposals of the DSM-5 “Somatic Symptom Disorders” workgroup. These are views shared by other advocates, patients and carers, internationally, by the US CFSAC Committee (the Chronic Fatigue Syndrome Advisory Committee that provides advice and recommendations to the Secretary of Health and Human Services) and by a number of US 501(c)(3) registered patient advocacy organisations. At no time have I stated or implied that I am “trying to get CFS reclassified as ME”. It should also be noted that I have had no involvement in or input into the initiative of the US Coalition4ME/CFS to make representations to the NCHS Committee responsible for updates to the US specific ICD-9-CM and development of ICD-10-CM, which replaces ICD-9-CM in October 2013. I hope this makes my position clear and I trust that there will be no future misrepresentation of my views or my actions on any platform. Discussion of the issue of the long-standing proposals for the coding of Chronic fatigue syndrome in ICD-10-CM was on the agenda of the meeting of the ICD-9-CM Coordination and Maintenance Committee which took place on September 14. These materials and links and related ICD-10-CM coding issue material will be added to this site in due course. Post announcing launch of second DSM-5 public review period with links to DSM-5 Development site and to media coverage. Copy of APA News Release No. 11-27 announcing the posting on 4 May of revised draft criteria for DSM-5 on the DSM-5 Development website and a second public review period running from May to June 15. Part 1 of this report is a Q & A addressing some of the queries that have been raised with me around the DSM-5 public review process. Includes table comparing “Current DSM-IV Codes and Categories for Somatoform Disorders and ICD-10 Equivalents”. 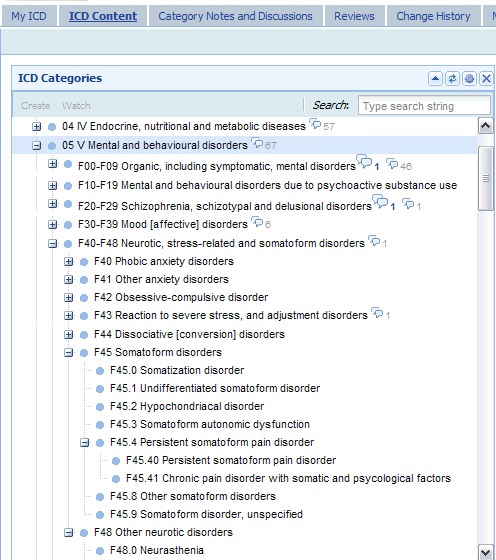 Also includes a screenshot from Chapter 5 (V) Somatoform Disorders (the F codes) F45 – F48.0 (as displaying in the iCAT Alpha Drafting platform in November 2010; this drafting platform has since been replaced by another public Alpha drafting browser launched on 17 May 2011 – see Post #81: ICD-11 Alpha Drafting platform launched 17 May (public version): http://wp.me/pKrrB-16N). In Part 2 of this report, I set out the latest proposals for draft criteria (dated 14 April 2011) from the DSM-5 Somatic Symptom Disorders Work Group, as published on the DSM-5 Development website, on 4 May. Information on registering for and submitting comment in the second DSM-5 public review. In Part 3 of this report, I posted extracts from “Disorders Description”, the first of the two key PDF documents that accompany the revised proposals, highlighting passages in yellow to indicate why ME and CFS patient representation organizations, professionals and advocates need to register their concerns via this second public review. In Part 4 of this report, I posted the complete text of the key “Rationale” document that accompanies the draft proposals of the Somatic Symptom Disorders Work Group, omitting several pages of references to published and unpublished research papers. Sets out why patients, patient organizations, advocates, clinicians, allied health professionals, lawyers and other professional end users need to review the proposals of the Somatic Symptom Disorders Work Group and submit responses. Includes copy of post in Word .doc and PDF formats. Full copy of the submission made in last year’s DSM-5 public review, by Kenneth Casanova, Board member and past President, Massachusetts CFIDS/ME & FM Association. The next meeting of the Chronic Fatigue Syndrome Advisory Committee (CFSAC) takes place on Tuesday and Wednesday, 10 and 11 May 2011. A copy of the Agenda for this meeting will be posted as soon as it becomes available. The Chronic Fatigue Syndrome Advisory Committee (CFSAC) provides advice and recommendations to the Secretary of Health and Human Services via the Assistant Secretary for Health of the U.S. Department of Health and Human Services on issues related to chronic fatigue syndrome (CFS). It is hoped that the issue of proposed codings for the forthcoming US specific Clinical Modification of ICD-10, which will be known as “ICD-10-CM” and which is scheduled for implementation in October 2013, will have been tabled for further discussion. The CFSAC Recommendation adopted at the May 2010 meeting is problematic and requires further discussion and revision. • Administrative and management support for CFSAC activities is provided by the Office of the Assistant Secretary for Health (OASH). However, staffing will continue to be provided primarily from the Office on Women’s Health, which is part of OASH. Dr. Wanda K. Jones, Principal Deputy Assistant Secretary for Health in OASH, will continue in her role as the Designated Federal Officer for CFSAC. AGENCY: Department of Health and Human Services, Office of the Secretary, Office of the Assistant Secretary for Health. SUMMARY: As stipulated by the Federal Advisory Committee Act, the U.S. Department of Health and Human Services is hereby giving notice that the Chronic Fatigue Syndrome Advisory Committee (CFSAC) will hold a meeting. The meeting will be open to the public. DATES: The meeting will be held on Tuesday and Wednesday, May 10 and 11, 2011. The meeting will be held from 9 a.m. until 5 p.m. on May 10, 2011, and 9 a.m. until 4:30 p.m. on May 11, 2011. ADDRESSES: Department of Health and Human Services; Room 800, Hubert H. Humphrey Building; 200 Independence Avenue, SW., Washington, DC 20201. For a map and directions to the Hubert H. Humphrey building, please visit http://www.hhs.gov/about/hhhmap.html . FOR FURTHER INFORMATION CONTACT: Wanda K. Jones, DrPH; Executive Secretary, Chronic Fatigue Syndrome Advisory Committee, Department of Health and Human Services; 200 Independence Avenue, SW., Hubert Humphrey Building, Room 712E; Washington, DC 20201. Please direct all inquiries to cfsac@hhs.gov . SUPPLEMENTARY INFORMATION: CFSAC was established on September 5, 2002. The Committee shall advise and make recommendations to the Secretary, through the Assistant Secretary for Health, on a broad range of topics including (1) the current state of knowledge and research and the relevant gaps in knowledge and research about the epidemiology, etiologies, biomarkers and risk factors relating to CFS, and identifying potential opportunities in these areas; (2) impact and implications of current and proposed diagnosis and treatment methods for CFS; (3) development and implementation of programs to inform the public, health care professionals, and the biomedical academic and research communities about CFS advances; and (4) partnering to improve the quality of life of CFS patients. http://www.hhs.gov/advcomcfs when it is finalized. The meeting will be broadcast over the Internet as a real-time streaming video. It also will be recorded and archived for on demand viewing through the CFSAC Web site. Public attendance at the meeting is limited to space available. Individuals must provide a government-issued photo ID for entry into the building where the meeting is scheduled to be held. Those attending the meeting will need to sign-in prior to entering the meeting room. Individuals who plan to attend and need special assistance, such as sign language interpretation or other reasonable accommodations, should notify the designated contact person at cfsac@hhs.gov in advance. Members of the public will have the opportunity to provide oral testimony at the May 10-11, 2011, meeting if pre- registered. Individuals who wish to address the Committee during the public comment session must pre-register by Monday, April 18, 2011, via e-mail to cfsac@hhs.gov . Time slots for public comment will be available on a first-come, first- served basis and will be limited to five minutes per speaker; no exceptions will be made. Individuals registering for public comment should submit a copy of their oral testimony in advance to cfsac@hhs.gov prior to the close of business on Monday, April 18, 2011. If you do not submit your written testimony by the close of business Monday, April 18, 2011, you may bring a copy to the meeting and present it to a CFSAC Support Team staff member. Your testimony will be included in a notebook available for viewing by the public on a table at the back of the meeting room. All testimony and printed material submitted for the meeting are part of the official meeting record and will be uploaded to the CFSAC Web site and made available for public inspection. Testimony and materials submitted should not include any sensitive personal information, such as a person’s social security number; date of birth; driver’s license number, State identification number or foreign country equivalent; passport number; financial account number; or credit or debit card number. Sensitive health information, such as medical records or other individually identifiable health information, or any non-public corporate or trade association information, such as trade secrets or other proprietary information also should be excluded from any materials submitted. Executive Secretary, Chronic Fatigue Syndrome Advisory Committee. • The Secretary should ask the blood community to defer indefinitely from donating any blood components, any person with a history of chronic fatigue syndrome. • The Secretary should recognize the special challenges of ensuring that CFS is part of any efforts to train or educate health care providers under health reform. • The Secretary should direct CMS, AHRQ, and HRSA to collaborate on developing a demonstration project focused on better value and more efficient and effective care for persons with CFS. This can be a public-private effort, and monitoring outcomes and costs should be part of the overall evaluation. • The Secretary should ask the Designated Federal Officer to explore adding a web-based meeting to conduct CFSAC business. HHS has no plans at this time to change this classification in the ICD 10-CM. • Develop a national research and clinical network for ME/CFS (myalgic encephalomyelitis/CFS) using regional hubs to link multidisciplinary resources in expert patient care, disability assessment, educational initiatives, research and clinical trials. The network would be a resource for experts for health care policy related to ME/CFS. • Engage the expertise of CFSAC as HHS moves forward to advance policy and agency responses to the health crisis that is ME/CFS. • Adopt the term “ME/CFS” across HHS programs.